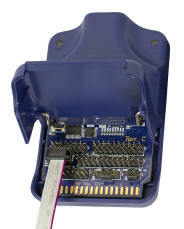 The USB Multilink Universal Interfaces greatly simplify the task of programming and debugging embedded target systems. They allow a PC to communicate with a target processor through a high-speed USB interface at the PC and a debug port at the micro. The PC can then control the microprocessor via the debug port of the target. The Multilink Universal is able to provide communications with a variety of NXP/Freescale MCUs. These different families of CPU use different "standard" ports and the Universal overcomes this by having multiple headers, which can be accessed simply by flipping open the plastic case. Ribbon cables for all the supported MCUs are included. 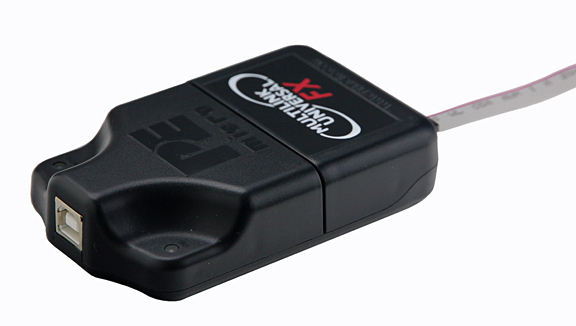 With suitable software the Multilink Universal can be used to program the flash memory of the target micros and to debug code running on them. There are two models in the range - The Universal (for literature) which is lower cost and the Universal - FX (for literature) which provides significant performance improvements. 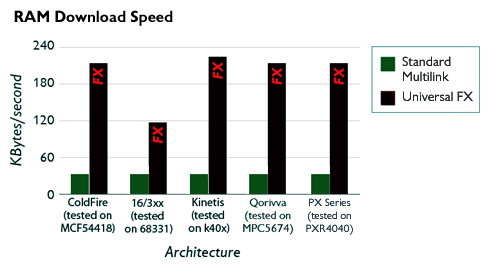 For Synchronous architectures such as the Kinetis, Qorivva, Coldfire V2-V4, 683xx, H series and the DSC the communications can run at 4 to 10 times faster than the Universal or the older Multilink interfaces. By adding the appropriate PEmicro PROG software for the CPU of your choice these units can program Flash memory and EEPROMs on the chip or attached to it. SOFTWARE COMPATIBILITY: If you are using older software with the USB Multilink Universal FX, you may need to upgrade to a more recent version that supports the FX. You may check here to see if your software supports the FX. The Universal + PROG combination makes a good Flash programmer for development and small batch production -- if you want a volume production tool perhaps to integrate into an ATE system you should consider our Cyclone range of programmers.